Take a closer look at LA’s bohemian Arts District on this 2-hour private walking tour. Uncover the little-known treasures of this vibrant neighborhood passing by interesting graffiti, hidden coffee shops, stylish galleries, trendy boutiques, and some of the best hipster eating and drinking cafes. Discover quirky blend of street art as your friendly local guide will point out the main benchmarks of Arts District's history which once started as a vineyard. Learn fun facts about Arts District's most popular murals and see why great artists make Arts District their home. Opt for a 3-hour tour, if you wish to see some of the highlights of Little Tokyo. See Home is Little Tokyo Mural, admire impressive exteriors of Koyasan Buddhist Temple and amble through Japanese Village Plaza. Finish at Go For Broke Monument and Japanese American National Museum. 10.00am Meet you private local guide at Groundwork Coffeeshop where you’ll start your graffiti adventure. Take a chance to taste some unique coffee served with butter and coconut oil, if you fancy, before you start the tour. See a lot of graffiti art on tour and check out art galleries in between graffiti, if you wish. Stroll down the streets and get an art fix at Hauser, Wirth & Schimmel, the extraordinary art gallery offering interesting art installations. Learn about rich history of the building which once used to be an old flour mill, check interesting art books for souvenirs in the adjacent bookstore and admire beautiful garden and outdoor spaces. 11.00am During your walk you’ll also visit world-class art galleries like LA’s Art Share, creative center and the city’s largest private art warehouse, as well as walk by the Alchemy Works and Jason Vass galleries. Check out the A+D Architecture and Design Museum, home to temporary exhibits showcasing the breathtaking examples of progressive architecture in LA (optional, at your own expense). Take a short stop at the corner of Traction Avenue and East 3rd Street, one of America’s hot spots for street art and feast your eyes at works from Shepard Fairey, JR, How and Nosm and many other artists. Head to adjacent The American Hotel, a century-old residential guest house, and get impressed by its murals. Learn about creation of the famous “Abuelita” (the Grandmother), portrait of a Navajo weaver and “Cream of the Crop” cartoon painting. 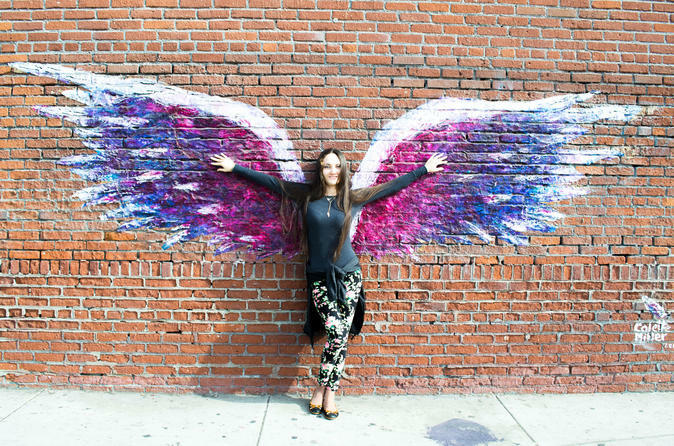 Get a chance to discover more impressive artworks during your exciting journey and do not forget to snap a photo in front of the famous “angel wings” fresco. 12.00pm Finish the tour at trendy Urth Cafe in the heart of Arts District, which serves extensive American menu with patio seating. Your guide will recommend you the best places to enjoy the rest of your day in Los Angeles. 12.00pm-1.00pm Or else opt for a 3-hour tour to cover Little Tokyo too. See Home is Little Tokyo Mural, admire impressive exteriors of Koyasan Buddhist Temple and amble through Japanese Village Plaza. Finish at Go For Broke Monument and Japanese American National Museum.